Albert Lightcap was the brother of my g-grandfather, Ernest Edward Lightcap. He was married to Alice Theresa Rafferty and they had three children: Ada, Clarence and Herbert. 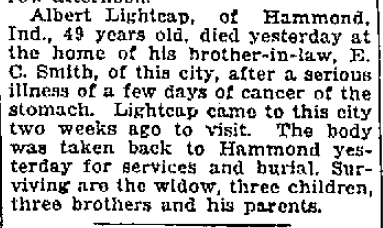 The notice of his death was published in The News and Sentinel in Fort Wayne, Indiana, on June 2 1921. Albert Lightcap, of Hammond, Ind., 49 years old, died yesterday at the home of his brother-in-law, E. C. Smith, of this city, after a serious illness of a few days of cancer of the stomach. Lightcap came to this city two weeks ago to visit. The body was taken back to Hammond yesterday for services and burial. Surviving are the widow, three children, three brothers and his parents.